A critically important task that either you or some co-worker needs to complete is a backup of the QuickBooks data file. Few items stored on your computer’s hard drive deserve as much caretaking as the QuickBooks data file does. Quite literally, the QuickBooks data file describes your business’s financial affairs. You absolutely don’t want to lose the data file. Losing the data file, for example, might mean that you don’t know how much money you have, you don’t know whether you’re making or losing money, and you won’t be able to easily or accurately prepare your annual tax returns. 1Choose the File→Create Copy command. 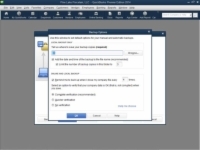 QuickBooks displays the Save Copy or Backup dialog box, which provides three options: the option to save a backup copy of your QuickBooks file, the option to create a portable company file, and the option to create an accountant’s copy. 2You want to save a backup copy, so click the Backup Copy option button; then click Next to continue. You can create either a full backup file or a portable company file when you copy the QuickBooks file. A portable company file is smaller than a backup file, so it’s more convenient to move around. For example, you can more easily e-mail a portable company file. The rub with portable company files is this: QuickBooks must work hard to scrunch the portable company file to a small size. QuickBooks also has to do more work to unscrunch the file later on when you want to work with it. After you click Next, the Save Copy or Backup dialog box appears. You can go directly to the Save Copy or Backup dialog box by choosing the File→Create Backup command. 3Indicate whether you want to save your QuickBooks backup file on your company’s computer or to QuickBooks’s offsite data center. Click Local Backup to indicate that you want to store the backup copy of your file on your computer’s hard disk or some removable storage device, such as a flash drive. 4Click the Options button to choose a backup location. 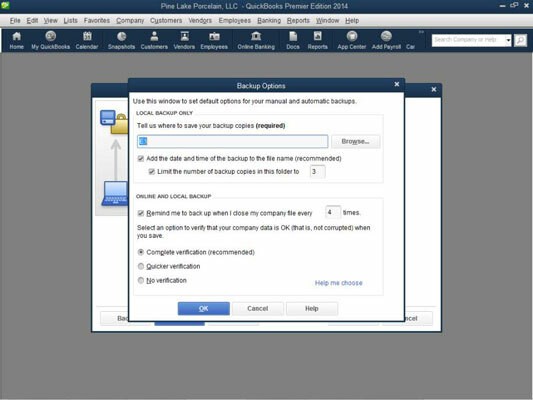 QuickBooks displays the Backup Options dialog box. 5Specify to which folder or disk location the company file should be backed up. You just enter a pathname directly in the box that tells where to save your backup copies. If you don’t know how to enter a pathname, click the Browse button. When QuickBooks displays the Browse for Folder dialog box, use its folder list to select the disk or folder you want to use for QuickBooks backups. 6(Optional) Select your backup options. Adding time stamps: To add the date and time of the backup operation to the backup file’s name, select the Add the Date and Time of the Backup to the File Name check box. Limiting backup copies: To tell QuickBooks to get rid of old backup copies, select the Limit the Number of Backup Copies in This Folder to X check box and then specify how many backup copies you want to keep by using the adjoining text box. Setting backup reminders: Select the Remind Me to Back Up When I Close My Company File Every X Times check box and the adjoining text box to specify that you want to be reminded to back up the QuickBooks file when you close QuickBooks. Your interval options include every time, every other time, every third time, and so forth. Enabling data verification: Use the verification buttons to tell QuickBooks that it should check for data integrity when it backs up your data. Select the Complete Verification radio button for QuickBooks’s best and most comprehensive verification. Alternatively, if you’re someone who doesn’t have time for the extra few seconds of double-checking that data verification takes, sure, select the Quicker Verification radio button. Better yet, throw caution completely to the wind — caution is for babies anyway — and select the No Verification radio button. 7Click OK when you finish specifying the backup location and options and then click Next. QuickBooks displays a dialog box (not shown) that asks when you want to back up. 8Specify when you want to back up. Typically, you want to back up when you choose the Save Copy or Backup command. In this case, when QuickBooks displays the Save Copy or Backup dialog box that asks the when question, click the Save It Now button. You can, however, also tell QuickBooks to regularly schedule backups of the QuickBooks data file according to some clever scheme by — when QuickBooks asks the when question — clicking the Save It Now and Schedule Future Backups buttons or by clicking the Only Schedule Future Backups button. If you tell QuickBooks that you want to schedule backups, QuickBooks displays a couple of dialog boxes that you use to create the new backup schedule by naming the schedule and by setting the days and times when backups should be scheduled. 9Click Finish to close the Save Copy or Backup dialog box. After you’ve specified how the backup operation should work, click Finish. 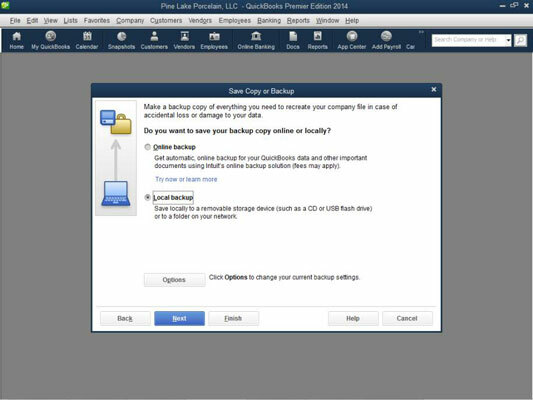 QuickBooks backs up (or creates a copy of) the current QuickBooks company file and stores that new file copy at the backup location.